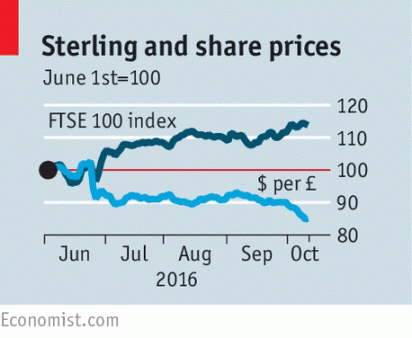 (The Economist)-RARELY do people compare the British pound to the Nigerian naira, Azerbaijani manat or Malawian kwacha. But on a measure of year-to-date change against the American dollar, sterling is near the bottom of the 154 currencies tracked by Bloomberg. The pound is down by 15% on a trade-weighted basis since the Brexit vote, and is plumbing the depths it reached in the 2008-09 financial crisis (see Buttonwood). The cause of sterling’s fall is the realisation that Theresa May’s government is moving towards a “hard” Brexit, which involves Britain leaving the European Union’s customs union and its single market. It is also driven by the fear that Britain is turning into a xenophobic, interventionist and unpredictable place, with calls to clamp down on foreign workers and foreign capital. For a country that is used to attracting swathes of investment from abroad because of its membership of the single market and stable political climate, this is a huge shift. With Britain’s current-account deficit (a measure of what it borrows from abroad) equal to a gigantic 6% of GDP, it is also a dangerous one. True, Britain is not heading for a balance-of-payments crisis. Its debts are issued in its own currency, so the cost of meeting its obligations will not soar as the currency falls. And Britain’s net capital flows tend to come in the form of foreign direct investment (FDI), as opposed to deposits or short-term debt. FDI will not disappear overnight in the way that deposits could. But it can be hard to recover from a loss of confidence. If foreign investment dries up, and the pound stays weak, Britons will be left permanently poorer. Unfortunately, far too many in Mrs May’s government are complacent about this. Many Brexiteers wrongly conclude that the pound’s slump is nothing but good news. Their argument is that a weaker pound will send exports soaring, herald a manufacturing renaissance and “rebalance” the economy away from services. Yet recent experience suggests that British exports do not respond quickly or strongly to a cheaper currency. The volume of exported goods is actually lower than it was before the Brexit vote. Exporting requires importing of supplies and other materials, and these are now more expensive. Within just a few weeks the year-on-year change in producer prices has neared 10%, the highest since 2011. The Brexiteers also fail to acknowledge the immediate hit to living standards that the pound’s slump has caused. Britons enjoy consuming things from abroad. Some 5% of household spending goes on foreign holidays. Domestic prices are affected, too: the pressures surfaced this week in a dispute between Tesco, a supermarket, and Unilever, a consumer-goods firm, which wants to increase the price of brands such as Marmite, a yeasty spread. Inflation may jump from its current level of 0.6% to 3% by next year, well above the Bank of England’s 2% target. This will be bitter medicine for the average Briton, whose real weekly pay is already about 4% lower than in 2007. Nominal wage growth fell to a measly 2% in the run-up to the referendum, and bosses are in no mood to offer pay rises now. Real wages will soon be falling once again. The combination of a slowing economy, rising inflation and shaky confidence constrains fiscal and monetary policy. The Bank of England is unlikely to raise interest rates in response to the temporary spurt of inflation caused by sterling’s fall. Yet gone are expectations that the bank will soon reduce the base rate of interest from 0.25% to 0.1%; a cut would prompt still more foreign capital to leave the country. The government may have a little room for manoeuvre. In its autumn statement, it is likely to change course from aggressive fiscal consolidation to mild expansion. But it, too, must be careful. Gilt yields have crept upwards as investors reassess the British economy, and could go a lot higher if the nasty rhetoric coming from ministers continues. The most sensible course, then, would be to heed markets’ concerns. The overwhelming weight of evidence shows that leaving the customs union and single market would exact a heavy toll on Britain’s economy. Remaining within them would require political courage, but has clear economic benefits. It is not too late to change course.